To be invited to Brussels for one's first solo exhibition when one was born and bred in Tennessee and lives in New York is one of the odd happenstances that always seem to befall Josh Smith, a young painter who for several years now has mostly painted a single subject: his name. From painting to painting, the letters that make up "Josh Smith" are extended, shortened, twisted, melted, or broken down until signifying nothing but meaninglessness itself: a clever and very sensible way of dealing with the question of subject, in all senses of the term. This first exhibition presented eight paintings of average size (sixty by forty- eight inches) and twelve small ones (eighteen by fourteen inches), ail made over the past two years. This is only a sampling, however, of the work of an extremely prolific artist. For example, at the end of his stay in Brussels, Smith bought a beef heart, which he then painted from every angle on a dozen small canvases. These he left behind with artists he'd met in the city. Smith's productivity also finds expression in books, some of which were included in the exhibition. Photocopied in editions of twenty, they may assemble as many as a hundred drawings or more. 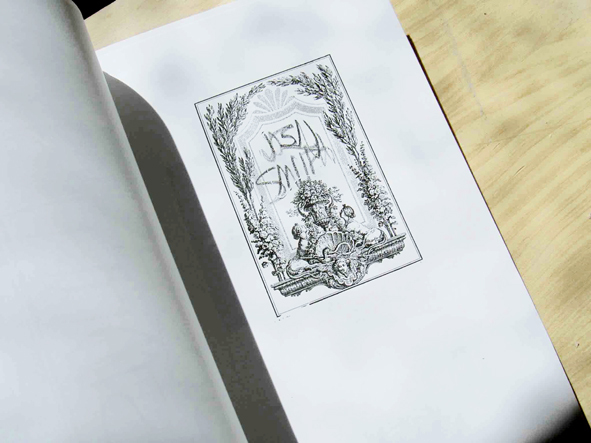 Twenty of these editions were displayed on a table at the center of the exhibition, among them Ghost and Devils (2003), Boston Book (2003), and Lives, Adventures, Exploits: Frank and Jesse James (2000), all of which compiled drawings linked to the subjects evoked by the tides. Others, such as L.A. 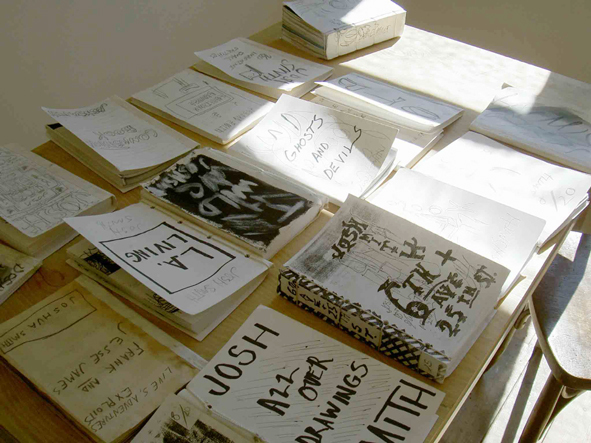 Living (2003), composed of photocopies of the Los Angeles yellow pages, or Composition Book (2003), a collection of small informal drawings, are more abstract. Without any irony at all, Smith's painting links a naive spontaneity, claimed as such, to a corrosive lucidity. Together these produce an unsettling mixture of pictorial ambition and humor. Out of very little material, in both literal and figurative senses, the artist creates new chromatic harmonies and discords while at the same time dismantling the structures he's used, thus creating contradictory movements that animate his compositions from within. Some of the paintings here register harmonies in a spectrum of grays and browns (Get Down, Get Brown, 2003; 5th Ave +116th St, 2003; Gray Painting, 2002). Others, more disparate, play on the effects of contrast and superimposition. The whole evokes some of the most illustrious figures of modem and contemporary painting, from Jackson Pollock to Albert Oehlen, without any one influence ever coming to dominate and thereby reduce its strange singularity, engendered by the joy of painting, which is what ensures its continued vitality.